11/17/08: The tiny house movement is getting HUGE as Americans shrink their budgets and look for affordable alternatives to their Stuff Nation. Peter King has been building tiny houses for years and hopes to teach others the basics of simple living. Silent Mind, 2012 Here We Come, "I Want to Go Home"
How do I get in touch with Mr. King? I think I might be able to get a few people who would want to go up and learn how to build a house. I am interested as well. Phone / Email ??? Hi, I'd like to write Peter a letter. I am having a tiny house built right now and might need to have another built sometime later which I'd like to do myself. 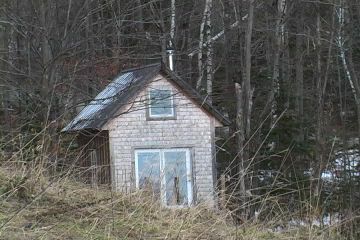 Even if I didn't, however, I'd like to show him what we've done already since his 10 x 10 cube house is similar to mine. Do you have his address? Thanks so much for your interest in Peter King and his Tiny Houses. If you do a google search for Peter King in Bakersfield, VT, you will find a phone # and an address. Not surprisingly, he does not do email. Is it possible to download the original high-quality version of the video? Eva, great video. We never got a chance to meet up, but I'll be back in VT this June, building a house actually. This is great food for that. Still working out the details. But I love what Peter King is saying. For a family of 6, I'm trying to shrink it down to the bare minimum. Thanks Erik! Wow, a family of 6 in a tiny house sounds cozy and rather nice. Appreciate your interest and hope you guys get a chance to cross paths. Wow, who has even a small business and doesn't do email, how weird is that!!!! Excellent video Eva. Thank you! Although it had been my intention to blog about Peter King and his tiny houses work sooner rather than later (particularly given I had known of your 7Days Stuck in Vermont video on the subject as well as the Tiny House blog post about such too), after doing some research this evening, I stumbled upon the recent Burlington Free Press article and figured it was high time I blogged something up while it was still fresh in my mind to do so, keeping the post both basic and simple of course, here. haunted houses of United Kingdom country ?? Even if I didn't, however, I'd like to show him what we've done already since his 10 x 10 cube house is similar to mine. Do you have his address? Peter King can be reached on his land line at: 802.933.6103. I do not know his address and he does not do email. Thanks for this great article! It has been very insightful.